I have always found best an incredibly alienating sign-off. So alienating that I am tempted to say that it should be abolished. Though as you’ll see, I’ve become ambivalent about that view too. What is it that bothers me about Best? It’s rote, of course. It’s a bit cold. It’s terse. It’s a mindless convention, and while I don’t hate conventions per se, I hate when conventions deprive us of an occasion for some sort of human warmth. It’s styrofoam sociability. If you read this little word literally, it raises an obvious question — best what? Best… indifference? Best customs? Best formalities? Best is a modifier, but what does it modify? Best wishes? That’s what I think it is usually supposed to mean, but best wishes is truncated, too. I suppose it means something like I’m sending you my best wishes or I wish you the best (in life?). Still, instead of writing Best, I like writing yours or take care (for friends) or some pithy adverb expressing a mood or cheers (when I feel informal). One of my grad school teachers was famous for signing messages VBW, S, for “very best wishes, sincerely.” I used to sign off peace when I was in college, but it long since started to feel like an affectation. Sometimes when I just sign my name, eli, that feels almost unmediated. But honestly, I mostly sign my work email best wishes because at least it’s best something. And if I’m even more honest, the fact is that best wishes becomes a bit rote, too. 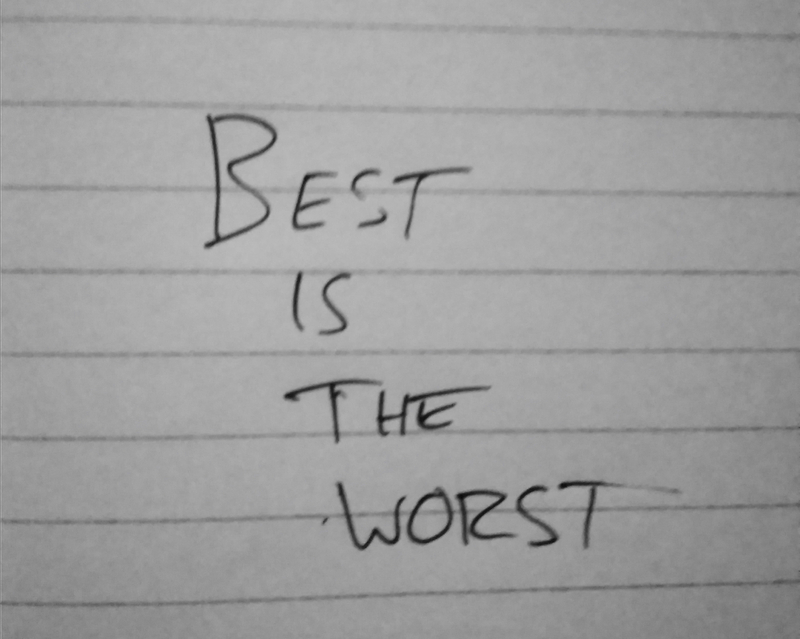 I want to say we should abolish Best, but I begin to suspect that any valediction will become rote if it’s overused, and thus relatively empty. The more I think about it, the less I’m sure what would be a good norm in writing sign-offs. Perhaps there can be no good norm in the way I want, because the very reason we have norms is to save people from having to particularize and humanize their professional relationships. Is it possible to institutionalize warmth? It comes to mind that in any cultural system, there is a set of possible greetings and sign-offs that are organized through their differences from each other. Thus, in my part of American culture, the handshake is the standard professional greeting, and it’s distinguished primarily from waves (more informal) and hugs and kisses (more intimate), on an ascending hierarchy of warmth and intimacy. The handshake is a bit impersonal, ultimately, not because of any of its tangible qualities, but because of its symbolic difference from hugs and the other options. It follows that what makes best impersonal is that it’s marked as being more cold and institutional than yours or sincerely, and also more formal than take care, peace, etc. So if we were to put an alternative term like kind regards where best currently sits in our system of sign-offs, it would presumably become just as hollow. The question is thus not about abolishing best but about figuring out why we need to be able to ritually signal this very minimal warmth. Why do we need to constantly exchange cold warmth with each other? What is the meaning of institutionalized sterility? It’s more than nothing, but by design, it’s not much. If you write best a lot, what’s it doing for you? Is it just the easiest option, given the cultural environment? Or does it have some aesthetic merits I’m missing? Maybe best is, perversely, doing something useful for me after all. It gives me a thing to very publicly not do. Does that just mean I’m inhabiting the worst form of hipster culture — in essence, depending on mainstream norms as something to reject, as if that rejection in turn conferred a tiny bit of authenticity?